Speaking today on CNBC's Squawk Box Europe, Faber said: "Basically I think everybody will agree that in an economic system the market solves problems best." "I don't have a very high opinion of Mr. Obama," Faber said, adding "I was negative of Mr. Bush but I think Mr. Obama makes him look like a genius." The unintended consequence was that "the annual expenditures for oil in the US increased… you had another US$500 billion tax on the consumer. That pushed the consumer down even more in his reduction of consumption," Faber said. "Most people don't have money left after the policies implemented in theUS," Faber said. "These people, they should all send a thank you note to Ben Bernanke for printing money because it didn't benefit the US, it benefited emerging countries." "When someone tells me the government should regulate the banks, they shouldn't. It's a disaster. But they should have interest rates that are high, that curtail speculation," Faber said. "The average family will be hurt by that, and then in order to distract the attention of the people, the US governments will go to war," he said. "In my opinion it's beyond repair. If the US were a corporation and had proper accounting, they would be 'Triple C, ' nobody would buy their bonds ," Faber explained. "Having said that, in the near term I think the dollar could rally because the others are no better, the others are worse," said Faber. "I think that the dollar will rally now against the euro and against the pound sterling and probably against the yen." "So, whereas it was wise to own long-term US government bonds between 2000 and 2009, for the next 10 years I expect a massive outperformance of equities compared to bonds," he said. "I think both the US markets and Japan this year might outperform emerging markets," he said..
"When you look at the US… it's a total disaster, we're all doomed, we're doomed," he said. 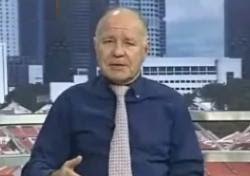 Dr Marc Faber is editor of the Gloom Boom & Doom Report and the author of "Tomorrows Gold". Dr Faber is a contrarian. To be a good contrarian, you need to know what you are contrary about. It helps to be a world class economic historian, to have been a trader and managing director of Drexel Burnham Lambert when the firm was the junk bond king of Wall Street, to have lived in Hong Kong for a quarter of a century, and to have a contact book crammed with the home numbers of many of the movers and shakers in the financial world. Famous for his approach to investing, Marc Faber does not run with the bulls or bait the bears but steers his own course through the maelstrom of international finance markets. In 1987 he warned his clients to cash out before Black Monday on Wall Street. He made them handsome profits by forecasting the burst in the Japanese Bubble in 1990. He correctly predicted the collapse in US gaming stocks in 1993; and he foresaw the Asia-Pacific financial crisis of 1997/98 and the resulting global volatility.